As the Snake River flows north out of Hell's Canyon, there is a quiet place where the current takes a curious turnabout. It moves down the center of the river and turns upstream along the rocky shoreline. These waters cast hypnotic powers upon the occasional drifting log that circles by. Time becomes disjointed, and you cannot tell whether the log lingers for minutes or hours before it continues downriver. We call this place Buffalo Eddy, but people who were here long ago called it ilokotbatki. 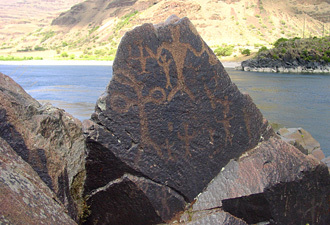 Basalt boulders at the river's edge boast a rich gallery of prehistoric rock. Some petroglyphs here date from about 4500 years ago, when the pharaohs built Egypt's oldest pyramids. Like other sites of the Nez Perce National Historical Park, this one reaches back to time immemorial. The rocky hillsides along the Clearwater River share the same heritage. They harbor stories that grandparents told to children in the old winter villages. Upriver is the Heart of the Monster, where the Nez Perce people first emerged upon the earth. At this quiet site, you hear the river flowing in the background while a Nez Perce elder tells this creation story both in his native tongue and in English. Downriver, a magnificent rock arch shows what became of two village headmen, Ant and Yellowjacket, who lived here before age of people. These headmen refused to quiet their noisy quarrel, so Coyote turned them to stone. The 38 sites of the Nez Perce National Historical Park stretch across Washington, Oregon, Idaho, and Montana. 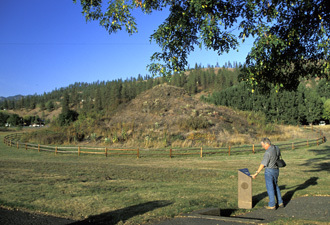 In addition to the ancient places, the park includes sites that tell about the changes that came to the Nez Perce as Euro-Americans poured into their country. 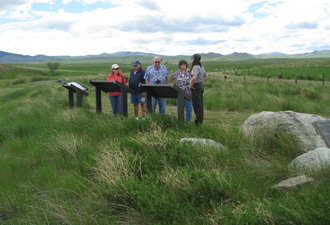 You can visit Weippe Prairie, one of the places where Nez Perce still dig the camas lily. Here Lewis and Clark staggered out of the Bitterroot Mountains, saw some Nez Perce boys playing, and followed them into Nez Perce leader Twisted Hair's village. At Canoe Camp the Nez Perce fed and supplied members of the Corps of Discovery and helped them build the canoes that carried them to the Pacific Ocean. Today's travelers still stop here to walk along the river and climb into an old-style dugout canoe. Rangers at the park's main visitor center at Spalding offer interpretive programs and enjoy answering questions about the ancient Nez Perce people and their continuing story today. Throughout Nez Perce National Historical Park, you will encounter stories of cultural change from ancient times to the present. It's a human story of nobility and tragedy, conflict and peace, tradition, and creativity.